"We worry about where we're going ... not where we've been. Makuta wanted us to turn on each other, fight among ourselves, so that he could succeed. But we stopped him. And we will go on stopping him and others like him. It's who we are - it's what we do." Nokama was a Ga-Matoran teacher, the Toa Metru of Water, and briefly the Toa Hordika of Water. She later became one of the Turaga of Mata Nui along with the other Toa Metru, and was one of the Turaga of Metru Nui before Teridax's reign began. As a Matoran, Nokama worked as a teacher in the Ga-Metru Schools. On one occasion, she was playing near a Protodermis Canal and accidentally slipped and fell in it. The current carried the frightened and drowning Nokama all the way to Ko-Metru before her friends were able to rescue her. During her career, she received the prestigious awards of Exemplary Teacher and Innovative Protodermis Purification. After Macku, one of Nokama's students, discovered Dermis Turtles and their population exploded, Turaga Dume considered banning the Rahi completely from the city. It was Nokama and Macku who convinced him otherwise. Weeks before the Great Cataclysm, Toa Lhikan, following the Great Spirit's will, gave Nokama a Toa Stone and a map during one of her classes. Following the directions of the map, Nokama took the stone to the Great Temple, where she met five other Matoran: Vakama, Matau, Nuju, Onewa, and Whenua, who had also been given Toa Stones by Lhikan. Placing their Toa Stones in their respective slots in the Suva, the Matoran were coated with Lhikan's energy, which transformed them into Toa. Nokama alone supported Vakama in his claim of a vision involving the powerful Great Disks and a quest to find them. This set a precedent that continued throughout the time of the Toa Metru; when Vakama made seemingly outlandish statements, Nokama would support him and insist that the others follow his lead. Gathering their individual weapons from the Great Temple, Nokama remembered a carving in the sanctuary that related to the locations of the Great Disks. The team agreed to split up and find the six Matoran who knew those locations. Upon hearing Vakama mention that one of Nokama's former students, Vhisola, knew the location of a Great Disk, Nokama departed to seek her out. After an inconclusive search of Vhisola's home and a narrow escape from Vahki Bordakh, Nokama paid a visit to Vhisola's school laboratory, only to find it ransacked. A Ga-Matoran worker's report that a four-legged creature was responsible for the damage only worried Nokama further, as Vakama had described seeing none other than a four-legged creature in his vision. Worried, Nokama returned to Vhisola's home and used her elemental power for the first time, firing a shot of Liquid Protodermis to knock off an ornament on a house down the street and distracting the Vahki surrounding the house. A more thorough search of the house revealed a tablet depicting a powerful disk next to the Great Temple. As she raced to the temple, Nokama found a crowd of Matoran gathered around a tall building with Vhisola on its roof. Using the water canals to vault herself up, she steadied herself and Vhisola, saving the Matoran. Even after this adventure, Vhisola still had to be persuaded to help the Toa retrieve the Great Disk. Returning to the Great Temple with Vhisola, Nokama regrouped with the Toa Metru, who had gathered the other five Matoran who knew the locations of the Great Disks. As each Toa related their dangerous search and experiences, they deduced that one of the six Matoran had betrayed the others to find the Great Disks themselves; all evidence led to Ahkmou. After the six decided to split into three teams while searching for the disks, Nokama, Matau, Vhisola and Orkahm searched near the Temple to gather one of the disks hidden below the waters. Nidhiki sprung a trap, nearly drowning Matau in a canal, but Nokama was able to save him. She alone dove into the sea beneath the Great Temple to retrieve the legendary Disk, where she found it wedged between two teeth of the Dweller in the Deep. As Nokama returned to the surface, she observed that her companions were being threatened by Vahki; through a well-timed feint, she directed her Rahi pursuer at the Vahki, and they began to battle, allowing the Toa and Matoran to escape. Nokama accompanied Matau, Orkahm, and Vhisola to Le-Metru, where Orkahm revealed the location of the Great Disk: trapped inside a force sphere in the transport chutes. She watched as Matau dove into the Notch and retrieved the Disk. Later on, the six Toa and Matoran reunited, discussing how the Great Disks could defeat the Morbuzakh plant. With the hiding place of the Morbuzakh's king root revealed to be in the Great Furnace at Ta-Metru, Nokama declared Vakama to be their leader in the ensuing battle. Traveling into the Great Furnace, the Toa were attacked by peculiar pellets, which Nokama realized were Morbuzakh seeds. With the aid of Nuju, she freed the others, who had been trapped in vines. Within the Great Furnace, they encountered the Morbuzakh King. Nokama drained her elemental powers keeping her team cool from the intense flames. In the ensuing battle, she initiated the plan to work together before they became victorious over the Morbuzakh. Before they could travel to the Coliseum to be hailed as Toa, the Toa Metru first had to travel to Onu-Metru to seal a crack in the seawall protecting the Archives. They soon found themselves under attack by the shape-shifting Rahi, Krahka. The Krahka could mimic not only their appearance, but their Elemental Powers as well. She captured all of the Toa except for Nokama, who defeated three Rahkshi on her own and was later able to relocate the other Toa Metru. When confronted by all six Toa Metru, Krahka was defeated and fled. After the confrontation with Krahka, the Toa traveled to the Coliseum, where they were accused by Turaga Dume (really Makuta Teridax in disguise) of causing the disappearance of Toa Lhikan. Nuju, Onewa, and Whenua were quickly captured, before Matau, Nokama, and Vakama were able to escape. The three fled to Ga-Metru, where they were attacked by Vahki Bordakh. Nokama was struck by a stun blast from a Bordakh's Staff of Loyalty and attacked Vakama, pushing him off a skyscraper. Vakama discovered that his Disk Launcher could be used as a jet-pack at that moment, and was able to fly to safety. Nokama, still influenced by the Bordakh's staff, tried to attack Matau, but was knocked over the edge of the building. She was saved by Vakama, and the fall's shock caused the staff's effect to wear off. The Toa escaped to Ta-Metru inside an Airship. After another battle with Vahki Nuurakh and the Dark Hunters Nidhiki and Krekka, the three Toa came to blows with the Tahtorak, a massive Rahi that had been awakened during their earlier fight with Krahka. They defeated it by using weakening disks on the ground beneath it, and the Tahtorak plummeted into the depths of Metru Nui. Afterwards, the trio journeyed to Po-Metru, where Nokama discovered her Kanohi mask power of Translation when she was able to communicate with a herd of Kikanalo. Nokama enlisted the aid of the Kikanalo in locating Toa Lhikan, and the Kikanalo led them to the Canyon of Unending Whispers. With the aid of the chief Kikanalo, Nokama defeated many Vahki Zadakh guarding the prison. She, Vakama, and Matau then entered the tunnels leading to the Prison of the Dark Hunters, where they met up with the other Toa Metru, who had escaped with the newly transformed Turaga Lhikan. The Toa discovered a Matoran Sphere with Turaga Dume trapped inside, and realized that the current Turaga was an impostor. After a three-way battle with Vahki Rorzakh and the vicious Lohrak, the Toa Metru escaped on an old Vahki Transport and hurried to the Coliseum. However, they were too late to rescue the Matoran of Metru Nui, who were trapped in Matoran Spheres. "Turaga Dume" revealed himself as Teridax shortly before Mata Nui fell asleep and the Great Cataclysm struck. While Teridax transformed, the Toa loaded several Matoran Spheres onto their transport and fled the city, heading for the Great Barrier. Teridax attacked, attempting to crush their vessel with pillars of protodermis, and scattered several of the Matoran Spheres into the Silver Sea. While Vakama and Lhikan took on Teridax, Nokama and the other Toa Metru retrieved the Matoran. They then joined Vakama and imprisoned Teridax in a Toa Seal, before leaving to find a new home for the Matoran. Journeying through the barrier on the floating vessel, which they christened "The Lhikan", after the late Turaga, the Toa fought against stranded Nuurakh and safely crossed over boiling water. Concerned about the six Matoran Spheres holding the ship afloat and the damage that the recent struggles might have caused them, Nokama dove underwater to inspect them. Seeing the pods secure, the Toa of Water ventured ahead to scout for further danger. Some time later, Nuju also breached the cave's river, after Nokama's absence began to worry him. "The Lhikan" was then pulled away from the two Toa by a whirlpool. As Nokama returned, she found Nuju being drowned by live seaweed and rescued him. They both safely swam back to the ship which the other Toa had managed to save from the hazard. Continuing onward, the Toa were attacked by multiple Kralhi, who captured them and "The Lhikan". The Toa learned they were being held captive by Mavrah, an Onu-Matoran and former friend of Whenua's, who had disappeared from Metru Nui with prehistoric Rahi after a study project about them had failed. Though the Toa attempted to explain to Mavrah that Metru Nui was ruined and that he had no reason to be their enemy, Mavrah denounced their story as a lie, and a conflict ensued. After fighting against the Kralhi, wandering Vahki Vorzakh, and ancient Rahi, the Toa were able to escape aboard their ship. During the resulting battle, Mavrah was accidentally killed by the Rahi, and a Matoran Sphere, containing Ahkmou, was lost at sea. After destroying the passage leading into the tunnel, Nokama carved an image of the Toa Metru on the cave's wall as a symbol of their triumph. The team subsequently reached the surface of Aqua Magna and discovered the island of Mata Nui. Nokama decided that the next Ga-Matoran settlement would be established on the very spot where the Toa Metru first set foot on the shore. While exploring the island, Vakama announced to his team that he had beheld another premonition, involving the creation of more Toa stones. Nokama, along with her brothers (the latter whom were wary of the idea) followed Vakama's example and housed a portion of their powers within six stones. After these Toa stones were hidden on the island for future Matoran, a new path to Metru Nui was discovered by Onewa, and the Toa Metru began the return journey to their city. On the long trek through the labyrinths beneath the island, the Toa Metru were abruptly attacked by the monster called Rahi Nui. During the encounter, in which the team barely emerged victorious, Nokama was severely wounded and poisoned by the Rahi Nui's stinger. The Toa hoped to find a cure in Metru Nui, but as she neared death, the option became impractical. The Toa Metru encountered and communicated with the roots of the plant Karzahni, which had been a prototype for the Morbuzakh. The plant made a deal with them: it would heal Nokama only if they in turn retrieved some Energized Protodermis for the Karzahni. The Toa concluded they had little choice but to agree, and after the Karzahni supplied Nokama with a temporary antidote, the Toa set out through the tunnels to steal a sample of the substance in a small vial. The Toa Metru ultimately found a pool of Energized Protodermis, but before they could claim the prize, the Energized Protodermis took physical form and refused to allow them to claim its substance. The Toa battled the Energized Protodermis and its mutated guardians, and thanks to a clever tactic by Vakama, tricked the Energized Protodermis into bringing down the pillars holding up the chamber. The Toa obtained their sample, and the rest of the pool was buried in the rubble. The Karzahni fully healed Nokama in exchange for the Energized Protodermis, but exposure to the liquid destroyed the plant. Upon finally returning to Metru Nui, the Toa Metru found the city covered in the webbing of the Visorak horde, which had occupied the city. The Visorak had hunted the many Rahi which ran free in the ruined city and stowed the remaining Matoran spheres in the Coliseum, from which Sidorak ruled the city. Having seen the city's new horrors such as mutant Rahi, malfunctioning Vahki, and wild Rahkshi, the Toa Metru decided to travel through the Archives to reach the sleeping Matoran. Encountering an injured Ash Bear in the archives, Nokama encouraged the Toa to perform an experiment, using a minute portion of their Toa power to heal it. They continued through the Archives, but upon exiting, they were paralyzed by the Rhotuka of several Keelerak and captured. After the ambush, the Visorak carried Nokama and her allies to the Coliseum. The Toa were strung up in cocoons and injected with the Hordika Venom of the Visorak. Thus, they were mutated into Toa Hordika - half-Toa, half-Rahi monsters. After their mutation, the cords suspending their cocoon prisons were clipped, and the Toa plummeted to certaindeath, but were caught at the last moment by the Rahaga. The Rahaga brought the Toa to Ga-Metru and explained to them that if the venom was not neutralized, they would remain Toa Hordika forever after. The Rahaga also related to them the legends of Keetongu, a mythical Rahi that could reverse the poison and make them Toa Metru once more. The Toa Hordika, however, decided their first priority was to rescue the sleeping Matoran rather than to search for Keetongu. Nokama, who was formerly the most peaceful of the Toa, now found it hard to control her Rahi side, finding her new closeness to the natural world thrilling and the warnings of Rahaga Gaaki counterproductive to her goals. She became concerned for the welfare of some aquatic Rahi such as the Razor Whales, many of which had been captured or killed by Visorak Boggarak. Nokama and Gaaki proceeded through the waters along Ga-Metru's coast as they first traveled to the Great Temple, in what was supposed to be a covert approach. However, Nokama was seized with excitement about her new closeness with the sea, and began to jump out of the water, compromising their secrecy despite Gaaki's repeated warnings. A group of Boggarak lined the coast, one striking Gaaki with a paralyzing Rhotuka. Nokama became frantic and charged a water Rhotuka, firing it into the sky and unleashing a massive lightning storm. The Visorak fled, but Nokama saw and bemoaned the devastation her power had unleashed. Gaaki explained how much more difficult it would be to keep her power in check as a Toa Hordika, and Nokama took Gaaki in one arm and continued the journey. Inside the Great Temple, Nokama and Gaaki began a search for Kanohi to bring to the island above. Upon opening the chamber where the masks were stored, Nokama found a Gate Guardian defending it. Finding the creature unwilling to move aside, she knelt to reason with it and fell victim to the attack of its true body, much larger than the image she saw and invisible to both Nokama and Gaaki. Losing more control with each blow the Rahi inflicted, she struck out with brutish physical assaults until Gaaki discovered the Rahi's true form. The Rahaga urgently instructed Nokama to use the water Rhotuka she had gained from her mutation, and upon doing so, the Toa Hordika saw the creature's outline in the ensuing rainstorm. Striking its leg, she toppled it and leapt upon it viciously, shouting at the creature until Gaaki gently urged her to suppress her inner Hordika. She and Gaaki proceeded into the chamber, but were surprised to find the names of Vhisola and the other finders of the Great Disks etched above the mask compartments, having been secretly uncovered by the Rahi Krahka during the battle as part of a plot to demoralize the Toa. The two eventually rejoined Vakama and his companion, Rahaga Norik, and together they continued towards Ta-Metru, where they caught up with Onewa, Nuju, Krahka (who had changed her mind and now opposed the Visorak), and the Rahaga Pouks and Kualus atop the massive Tahtorak. Together they went to Le-Metru, and the four Toa Hordika forced their way into a hangar where Matau and Rahaga Iruini were trapped by advancing Visorak. Climbing to the safety of the Tahtorak's back once more, the Toa Hordika were informed by Gaaki that the Zivon had just emerged from a portal to devour Whenua and his Rahaga companion, Bomonga. They quickly developed a plan for four of them to position themselves on several rooftops for a strike on the massive, otherworldly Rahi, with Krahka above and Onewa below. Once in position, the four Toa Hordika signaled one another with flashes from their tools, and Onewa fired his stone spinners at the ground, creating ruptures in the earth and toppling several buildings onto the Visorak. Vakama distracted the Zivon with a fire spinner, allowing Whenua and Bomonga to break free as the other Toa Hordika assembled on the ground to continue the battle. After Krahka and Tahtorak took on the Zivon, and all three Rahi were banished by a Kahgarak to the Field of Shadows, the battle ended and the Toa Hordika entered the command tower, burying Visorak corpses and expelling any Visorak still living. After a day of cleaning the tower, Iruini suggested that the Toa claim it, and the Toa did so, repairing the tower and rebuilding the gateway in the shape of a Kanohi Kiril, at Nokama's suggestion. Charging the tower with elemental power as instructed by the Rahaga, the Toa Hordika assembled inside and shared the information Krahka had revealed to them about their origins as Toa Metru, chosen individually by Teridax. Shortly after the airships were completed, the Rahaga told the Toa Hordika of the Makoki Stones and the Kanohi Avohkii. While hunting for his stone, Whenua accidentally triggered a flood. Nokama saved him from the rushing waves and went to Ga-Metru to find her own Makoki Stone, as Whenua suggested. She found it at the bottom of the sea and, upon surfacing, was attacked by Visorak. She knocked the majority into the water, but was herded by the remainder into a web. Nokama was rescued by Nuju, who tore the web with a Rhotuka and defeated the Visorak. Nokama told Nuju to find his stone in a Knowledge Tower. After all the stones were retrieved, the Toa met at the Great Temple and found the Mask of Light using the stones. They then escaped from the attacking Visorak, and left just before the room exploded. Some time later, Vakama left his fellow Toa Hordika in frustration. The Toa Hordika and Rahaga returned to the Great Temple, where the Rahaga sought to find further information on Keetongu. Nokama stood guard alongside her brothers, and confessed to Matau her difficulty suppressing the Hordika urges. In the morning, Nokama and her fellow Toa became concerned, as the Rahaga had not returned, and approached the Great Temple—only to find it ransacked and Rahaga Norik covered in rubble. Norik explained that Vakama was now in the service of Sidorak, king of the Visorak, and Roodaka, his cunning viceroy and queen-to-be. The other Rahaga had all been captured by Vakama and offered to Sidorak as proof of his loyalty. After Vakama's betrayal, the Toa Hordika finally decided to seek out Keetongu, believing that he was now the only hope for Vakama. Norik informed the Hordika that they need to "follow the falling tears to Ko-Metru until they reach the sky". Beginning the journey, they crossed a rope bridge, Onewa and Matau being the last. As Onewa stepped on, the bridge launched Nuju, Nokama, and Whenua into the air. They caught onto ledges in the ravine, while Norik was caught in the bridge. As Oohnorak ran after Onewa and Matau, the other Toa used the bridge as a slingshot and grabbed Norik, but Norik's weight pulled them into the water. Nokama led the other three to jump after Norik, as he knew where Keetongu was. Traveling through underwater chutes, the Hordika arrived at the Ko-Metru Hideaway. Here, they found Keetongu, and begged him for help. Keetongu refused until he learned of the Hordika's dedication to Vakama and the Three Virtues, and then agreed to help them. With Keetongu on her side, Nokama led an attack on the ruined Coliseum. The Toa Hordika conversed with Vakama, trying to dissuade him from his path, but Vakama ordered the Visorak to attack them. At Nokama's call, the Toa Hordika charged their Rhotuka and rode the spinners into the air to dodge the Visorak's opening volley and infiltrate the Coliseum. During this flight, Matau proceeded to the top of the Coliseum to face Vakama. While proceeding through the Coliseum, Nokama, Whenua, Onewa, and Nuju were ambushed by a Kahgarak and driven back out into the battlefield, where they and the freed Rahaga fought a losing battle against waves of Visorak. The battle was halted by Roodaka, carrying a piece of the seal that imprisoned Teridax, who tricked the Hordika into unleashing their elemental spinners on her. When the elemental Rhotuka hit her, the seal on Teridax's prison was undone, and he escaped and transported Roodaka to safety. Shortly afterward, Keetongu healed the Toa Hordika and turned them back into the Toa Metru. The Toa, Rahaga, and Keetongu loaded the remaining Matoran Spheres onto airships, and the Toa Metru departed to bring the rest of the Matoran to Mata Nui. The Toa Metru sacrificed their power to awaken the Matoran, and turned into the six Turaga. Nokama spent the next one thousand years using her weakened elemental powers to help the Ga-Matoran defend their village, Ga-Koro, from Rahi. Her right hand Matoran was Macku, while her left hand Matoran was Kotu. During her long stay on Mata Nui, she and the other Turaga captured and imprisoned hundreds of Kraata. About five hundred years after the Great Cataclysm, Ga-Koro was attacked by a Great Temple Squid, although Amaya boldly repelled it, although Nokama berated her for her reckless plan. As the Dark Time began to come to a close, Nokama was imprisoned by a Makika, and later freed by Takua. She went to the Kini-Nui to see Takua summon the Toa Mata. Nokama would witness the coming of the new Toa, and was the one who would appoint Takua as Chronicler while he was on his journeys around the island. During an attack on Ga-Koro, she and the rest of the villagers, save for Macku, were imprisoned in a hut, which then sunk to the bottom of Naho Bay. She worried frantically over what had become of Macku until Takua came, and talked to her through an air tube, reassuring her that Macku was fine. When Takua managed to repair the hut's pump, Nokama and her Matoran saw the Tarakava that imprisoned them return. Gali arrived at that moment and defeated the Tarakava. Nokama spoke with Takua, thanking him for helping her village, and kept Macku confined in the village for her own safety. When Takua returned to Ga-Koro, recruiting a special company on his journey to Kini-Nui, Nokama chose Macku to join with him, since she was miserable staying in her hut alone. When the Bohrok awakened, Nokama helped the Ga-Matoran defend their aquatic home and hosted the company of the Po-Matoran who had evacuated their village. Near the end of the Bohrok struggle a large squad of Pahrak invaded Ga-Koro's gate, attempting to destroy the village. Nokama sent Macku, Kotu and Hahli to dismantle the causeways, which held the Pahrak off for a time, though they later struck again. However, the Toa defeated the Bahrag and shut down the swarms before the Bohrok could do any significant harm to the village. The Matoran removed the Bohrok's Krana and put the Bohrok to work repairing Ga-Koro. While the Matoran were busy repairing their village, Nokama was informed by Hahli that Gali had stood before a giant tidal wave, but was rendered powerless to stop it. Nokama went to Gali's aid, and found that she was greatly angered by her loss of powers, and how her brothers refused to listen to her when she foresaw something like this happening. Nokama sympathized with her loss of power, and led her to the cavern in Naho Bay which the Toa Metru had journeyed through from Metru Nui, so she could find a Kanohi Nuva. She then closed off the cave, and hoped that Gali would learn on her own how to escape. When Gali found the mask and came out of the cavern, she asked Nokama if the carving that Nokama made one thousand years ago was that of her as a Toa. Nokama dismissed the idea, saying simply that Gali was a Toa, and that she was a Turaga. After the defeat of the Bohrok-Kal, Nokama appointed Macku and Hahli to be her Kolhii champions, despite the fact that Hahli had absolutely no experience in the sport. After the revelation of the Mask of Light, it was Nokama who translated the writing on the mask, which foretold of the coming of a Seventh Toa who would defeat Teridax. With Teridax defeated, the Matoran of Mata Nui traveled back to their old home, Metru Nui. Once Nokama and the other Turaga finished revealing the tales of Metru Nui, they left the island and sailed to the city in newly crafted boats. After the colony landed, Nokama, the other Turaga, and the Toa Nuva were immediately summoned to a council by Dume, where they learned that Mata Nui was dying. The Toa Nuva immediately left for the island called Voya Nui in search of the Mask of Life, the key to saving Mata Nui. As soon as their Toa disappeared, Jaller, the captain of the Ta-Metru Guard, assumed that the Turaga were hiding secrets again and confronted them, but the Turaga refused to discuss the mission taken by the Toa Nuva. As a result, Jaller commanded all of the Matoran to stop working until either Dume or one of the other Turaga revealed what was happening. The Turaga tried to start the work again, but failed. In the end, Nokama secretly told Jaller that Mata Nui was dying, and that the Toa Nuva were on a quest for the Mask of Life. When the Toa Hagah arrived on Metru Nui, they and the Toa Mahri had to convince the Turaga to allow them to implement a plan to allow the Toa Hagah to travel under the Coliseum, as was necessary for their hunt for Teridax. After the Order of Mata Nui occupied Metru Nui to convert it into a fortress for their final confrontation against the Brotherhood, Nokama and the other Turaga refused to comply with their plans. Therefore, they were confined in the Coliseum. Later, with the Toa Nuva's return from Karda Nui, she joined in the celebration of Mata Nui's awakening. This celebration was interrupted by Teridax, announcing the fulfillment of his plan and his usurpation of the Great Spirit. He then sent Rahkshi into Metru Nui to enforce his will, and Nokama went into hiding in the Archives with the other Turaga and Matoran of Metru Nui. She and the rest of the Turaga then found Krahka, who led the Toa Nuva through the underground tunnels to the shoreline. However, after Krahka departed to join the rebellion, Nokama and the other Turaga of Metru Nui were captured by Teridax's Rahkshi and were imprisoned in the Coliseum, with Ahkmou taking their place as the new "Turaga." Nokama is peaceful and wise, but is known for her excessive talking, and dislike of compromise. After the coming of the Toa Mata, she began to feel guilty of not telling the Toa about Metru Nui. During the events of the Bohrok-Kal, she finally could not resist, and took Gali Nuva to an underwater cavern, which has six drawings of the Toa Metru (although she herself never told her the tales). As a Toa of Water, Nokama could control, create or absorb water. When she became a Turaga, she retained reduced powers over water. As a Toa Metru, Nokama carried a Pair of Hydro Blades, which she could use to focus her Elemental Powers. As a Toa Hordika, the Hydro Blades became Fin Barbs and she gained a Rhotuka Launcher. Additionally, while a Toa Hordika, Nokama acquired a Combat Staff, which she used utilized during her time there. As a Toa, Nokama wore a Great Kanohi Rau, the Mask of Translation, giving her insight into the translation of both speech and written form of languages. 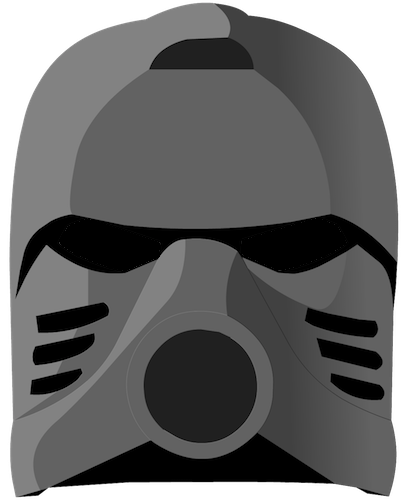 After becoming a Turaga, this mask was reduced in power and became a Noble Rau. She also was given five other Noble Kanohi by the Toa Mata. Nokama also carries a Fork Shaped Staff, as her Badge of Office, which she carved from the bones of the Makuta Fish while on her first journey to Mata Nui. Nokama was first released as a Turaga set in 2001. 8543 Nokama contained twenty-eight pieces. It also had a promotional release with Kabaya sweets in Japan (as 1419 Nokama). The right arm could be moved up and down using a small lever in her back. In early 2004 for North American buyers and mid-2004 for European buyers, 8602 Toa Nokama was released as a canister set featuring forty-six pieces. She had a small gear on her back, which could be turned to move Nokama's arms alternately. Her Hydro Blades could be attached to her back. Parts from the set could be combined with those of Toa Nuju and Whenua to build a Kraawa, or with the parts of all five other Toa Metru to create the Rahi Krahka. In 2005, 8737 Toa Hordika Nokama was released in winter in North America and during the summer in Europe. This set consisted of forty-eight pieces. Either of the set's two silver Rhotuka could be launched from her back and her right arm could be moved with a small gear on her shoulder. Pieces from the set could be combined with pieces from Toa Hordika Nuju to make a Sea Spider, or with parts from both Nuju and Onewa to make a Frostelus. Nokama appeared as a Toa Hordika minifigure in four playsets in 2005, 8757 Visorak Battle Ram, 8758 Tower of Toa, 8759 Battle of Metru Nui and 8769 Visorak's Gate. She carried a Combat Staff instead of her Fin Barbs. A large statue of Nokama in her Toa Metru form stands outside the BIONICLE Power Builder ride at LEGOLAND Deutschland. Unlike many large models of BIONICLE characters, it is not made of LEGO System Bricks. "She had never nursed any dreams of becoming a Toa. She had enjoyed her life as a teacher in Ga-Metru, gaining new wisdom each day and passing it on to others. Her happiest moments had been spent in a classroom or showing her students the ancient carvings at the protodermis fountains. Now that she was a 'hero,' she was starting to realize what a lonely role it could be." "Now that you're a Toa Metru you'll just cast an even longer shadow over me." "There are so many places to see and explore. What is it like under the sea? What lies beyond the sky? Where do all these strange creatures you see in the Onu-Metru Archives come from? Now I have the power to go wherever I please and learn those answers." "You are so wise, Gali, yet know so little. You are swimming in my wake, Toa. There is nowhere you can go that I have not traveled before." Actress Lesley Ewan voiced Turaga Nokama in Mask of Light. Tabitha St. Germain voiced Toa Nokama in the Legends of Metru Nui and Web of Shadows. This page was last edited on 16 March 2019, at 05:26.